Jaren Wilkey | Brigham Young University Jimmer Fredette responds to a standing ovation at his hometown game in Glens Falls, N.Y Djamila Grossman | The Salt Lake Tribune Jimmer Fredette hits a 3-pointer, pushing aside UTEP's Gabriel McCulley, in a Dec. 23, Djamila Grossman | The Salt Lake Tribune Jimmer Fredette gives an autograph to fan Trent Boulter after a game against the Unive Chris Detrick | The Salt Lake Tribune Jimmer Fredette jokes around with coach Dave Rose after a BYU victory this season. Steve Griffin | The Salt Lake Tribune After fans stormed the court following BYU's victory over San Diego State on Jan. 26, Ji George Frey | The Associated Press BYU's Jimmer Fredette yells toward the crowd after making a 3-pointer against San Diego Stat Trent Nelson | The Salt Lake Tribune Jimmer Fredette bulls past Utah's Jace Tavita during the rivals' game in Provo in 2010. Jimmer Fredette looks into the stands as he returns to Glens Falls, N.Y., for a game against Vermont on Dec. 8, 2010. He was welco Leah Hogsten | The Salt Lake Tribune Jimmer Fredette thanks fans for their support after defeating UNLV in Provo on Feb. 5. 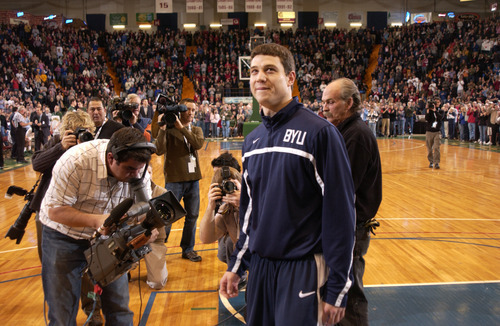 Jaren Wilkey | Brigham Young University Jimmer Fredette responds to a standing ovation at his hometown game in Glens Falls, N.Y., on Dec. 8, 2010. Djamila Grossman | The Salt Lake Tribune Jimmer Fredette hits a 3-pointer, pushing aside UTEP's Gabriel McCulley, in a Dec. 23, 2010 game in Provo. 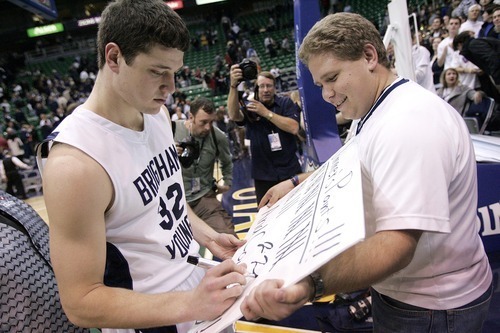 Djamila Grossman | The Salt Lake Tribune Jimmer Fredette gives an autograph to fan Trent Boulter after a game against the University of Arizona in Salt Lake City, on Dec. 11, 2010. 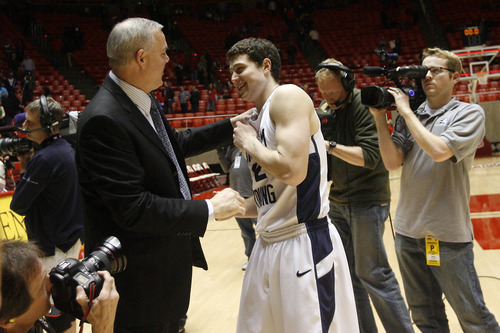 Chris Detrick | The Salt Lake Tribune Jimmer Fredette jokes around with coach Dave Rose after a BYU victory this season. Steve Griffin | The Salt Lake Tribune After fans stormed the court following BYU's victory over San Diego State on Jan. 26, Jimmer Fredette greets his admirers. George Frey | The Associated Press BYU's Jimmer Fredette yells toward the crowd after making a 3-pointer against San Diego State in Provo on Jan. 26. Trent Nelson | The Salt Lake Tribune Jimmer Fredette bulls past Utah's Jace Tavita during the rivals' game in Provo in 2010. Jimmer Fredette looks into the stands as he returns to Glens Falls, N.Y., for a game against Vermont on Dec. 8, 2010. He was welcomed home with a capacity crowd. 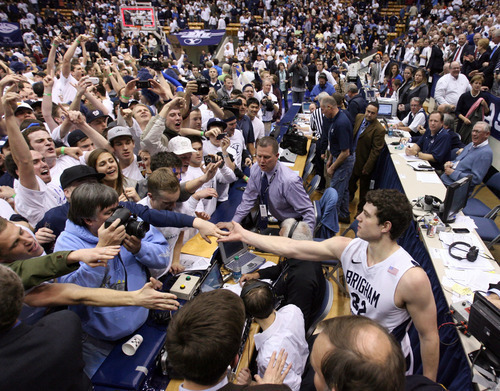 Andy Camp | Special to The Salt Lake Tribune Leah Hogsten | The Salt Lake Tribune Jimmer Fredette thanks fans for their support after defeating UNLV in Provo on Feb. 5. 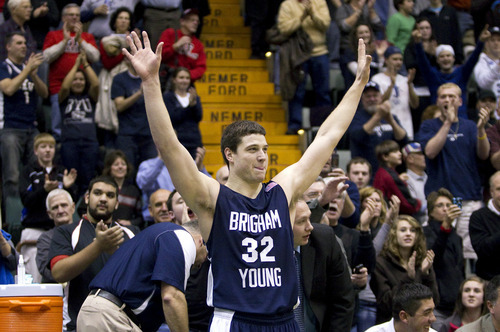 Another one of the major college basketball player of the year awards has gone to BYU's Jimmer Fredette. Friday morning, the Associated Press named Fredette its player of the year after the senior guard led the nation in scoring (28.5 ppg.) and the Cougars to one of their best seasons in school history. 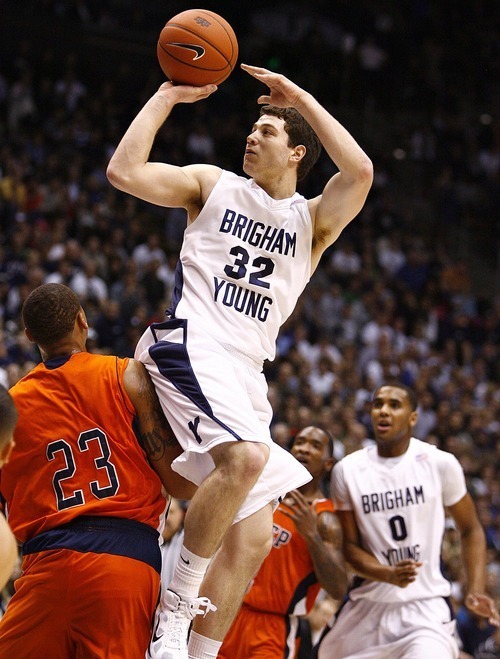 Fredette won the Oscar Robertston Trophy earlier this week, bestowed by the United States Basketball Writers Association. The two other "majors"  the Naismith Award and the Wooden Award  have yet to be announced. 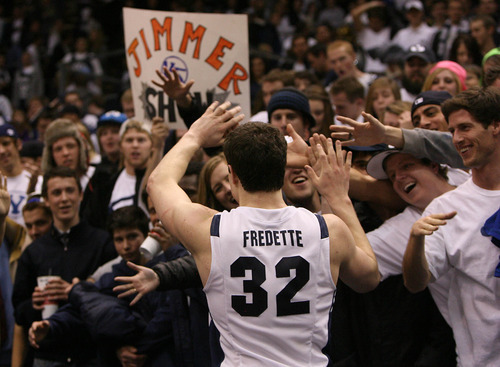 Fredette drew 48 votes from the 65-member national media panel that selects the AP's weekly Top 25. Voting was completed before the NCAA Tournament began. 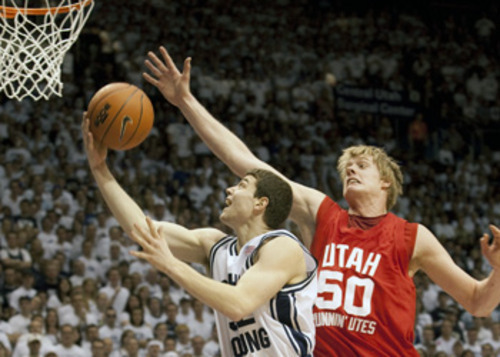 Fredette, from Glens Falls, N.Y., is the first BYU player to win the award and the first from the Mountain West Conference since Utah's Andrew Bogut won it in 2005. Kemba Walker of Connecticut was second with 11 votes, while Duke's Nolan Smith was third (five votes) and Ohio State's Jared Sullinger was fourth (one vote). Thursday night, Fredette received the Adolph Rupp Award as the top player in college basketball from the Commonwealth Athletic Club of Kentucky.